Social media platforms provide small-business owners with more low-cost marketing and advertising options than ever before. Either if you choose to handle this in house, or to work with an online marketing agency who can help you with fresh, viral content, you can achieve great results and keep your costs in control. Facebook and Twitter still provide entrepreneurs with access to hundreds of viewers, but another social media platform is quickly taking the lead. With over 70 million users and counting, Pinterest is a force to be reckoned with and a game changer for business owners. In case you’ve been living under a rock, let us fill you in. Pinterest is a digital archive where users can create virtual pin boards of collections from around the web (a.k.a. pins). Pins are arranged in a visually appealing format where users share images that lead to relevant content when clicked on. Business owners should think of this as a virtual storefront where prospects, near and far, window shop through your goods and services. Get on board and start increasing your profit! After creating your business Pinterest account, start putting together your boards. The trick to gaining pins is two-fold: create visually stimulating images that lead to relevant information. Take the Martha Stewart Pinterest page for example. Click on any of the showcased pins and you’ll find yourself directly guided to more information regarding the image posted. By posting images that are not only eye pleasing but informative, followers feel a stronger connection to the brand thus becoming loyal advocates. A great way to spread visually appealing information is through the use of infographics. These modern data charts offer viewers an eye-pleasing collection of well-researched information without pages of boring text. Because they cover the two unspoken rules of Pinterest (pretty and informative) these artfully crafted diagrams provide excellent pinning material. Don’t take our word for it, this infographic on why you should use infographics explains it all. With anything in life, the only way to measure success is to track it. 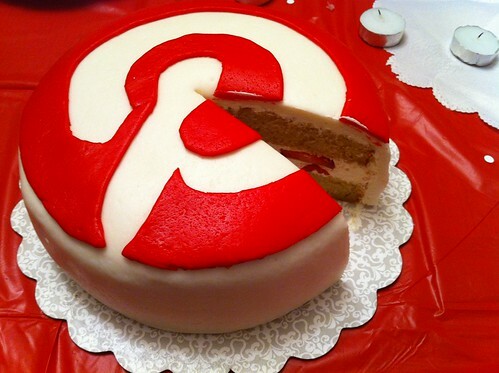 Pinterest offers web analytics to help you understand how pinners are engaging with your content. See what pins work, what pins don’t and how many visitors went to your website. Pair this up with free business accounting software to track your financials and see if increased traffic to your site is promoting online sales. By tracking where visitors are coming from, you’ll be able to monetize the rate at which Pinterest exposure grows your income. Encourage current website visitors to follow you on Pinterest by adding a widget. The “pin it” button presents visitors with the opportunity to pin images directly from your site to their pin boards. Once you set it, just sit back and let your customers spread the word for you. The Pinterest business resources guide walks you through the step-by-step process to have your widget up in no time. You can also add a “pin it” button to your mobile app for added exposure. Don’t get sucked in to this black hole of productivity. Pinterest has a knack for getting people hooked, making it easy to forget other social media platforms. To gain full reach of the social spectrum, take the time to share your pins on Facebook, Instagram, Twitter and anywhere else your customer might find you. You can also create a link between your social media accounts by using an app like Woobox who allows you to post a Pinterest box on your company’s Facebook page. Woobox also lets you see statics on how many views, visits and likes you received through the box. You can also use it for other social media accounts, just keep in mind that only the first box is for free. Don’t be afraid to experiment and find what your public searches online and likes most. You will also be able to find a lot of inspiration on Pinterest, which will help you if you haven’t decided yet to outsource social media management to an internet advertising agency. Is Google+ a threat to Facebook? Looks like Google+ is about to take things to a more personal level. Unlike Facebook, Google+ plans to differentiate contacts between: real friends, acquaintances, work people and few other categories. This division is based on the idea that sometimes people simply don’t feel like sharing certain feelings with all their contacts, but maybe just with close friends or maybe to people from work. Google+ wants to make you “feel like you’re connected to a group of people, like you’re part of something”. That “something” wants to be much more narrow and personal than the “Friends” list from Facebook. What’s your opinion? Will Google+ be a threat to Facebook? Facebook matches advertisers to users based on users’ interests, activities, favorites, their job titles, as well as the names of the groups they belong to and the pages they are fans of. That’s a lot of information, and Facebook is still a place where more often than not people are willing to share an unbelievable wealth of personal stuff with their Friends and the Facebook Corporation. From a marketer’s perspective, Facebook can offer profound insights into the personalities and circumstances of one’s target audience. As a gathering place on the Internet, Facebook’s communities and the community demographics developed therein can give marketers surgical precision as they find an arena for their ads. Competitive targeting focuses on both the positive and negative Facebook presence of a brand’s competitors on Facebook. A competing brand’s fans on Facebook might be an effective place to market your superior goods. Explain the added value of your product in your ad, offer a deal, try to win people over to your side. Fans of brands that are vulnerable, either because of an inferior product, negative press coverage, a recall of some sort, whatever the vulnerability may be, present fertile ground for converts. Essentially, marketers should try to find ways to leverage competitor investments in organizing their followers on Facebook both for their own Facebook presence and against the competitors themselves. Last week, Google bought PostRank, a social analytics service that tracks and measures social posts. With this acquisition, Google has gained a resource to better understand the social web, and that resource can be applied to great impact in several of Google’s key social arenas. What Is (or Was) PostRank? PostRank, in their own words, “is the largest aggregator of social engagement data in the industry.” The service allowed users to get real-time data on trending topics, high-volume conversations around the web, and their own posts. The company was established in 2007 under the name “AideRSS.” They re-branded as PostRank in October of 2008 in preparation for more socially oriented features. In July of 2009, the company released a service to track social trends (i.e. for datamining). Over the next year they expanded into brand management, blogging services, trend analysis, and consulting services. The company was acquired by Google earlier this month, but beyond that no details have been released regarding the transaction. A Google representative gave a fairly typical statement to TechCrunch about the company’s excitement to be working with the PostRank team, stating that PostRank has “developed an innovative approach to measuring web engagement, and we think they can help us improve our products for our users and advertisers.” Which is almost exactly the same as what they said about buying Slide. While we don’t know exactly what the PostRank team will be doing, it is known that they’re moving from their Waterloo, Ontario home to Mountain View, California, and statements from both Google and PostRank indicate that the team’s focus will continue to be on social tracking and analytics. As was the case with Slide, SayNow and Fflick acquisitions Google is most likely buying the talent of the development team, rather than the product. It’s fairly common knowledge that Google is going more social. Since Google’s first foray into the social scene (aka, the disaster that was Buzz), the company has been attempting, with mixed success, to implement social features. However, if one thing is certain, it’s that Google is committed to changing its poor position when it comes to the social web. They even went so far as tying the bonuses of all Googlers to the company’s success in social. Social media budgets often takes a backseat to search. After all, it’s easier to measure the ROI of search, so marketers see it as a safer bet. First, it’s easier to tie SEO and PPC directly to sales than, say, tweets or Facebook likes. Second, search offers an element of intentional targeting: whereas social users log-on to socialize, search users are actively looking for something – and probably that much closer to a purchasing decisions. But the social evolution of SEO has brought search and social closer together. Specifically, now that social signals impact rankings, marketers need to invest social as part of their SEO strategy. After all, search engines look for these “social signals” because they want to show human beings the most relevant search results. And what better way to determine whether something is relevant to humans than by measuring how many other human beings have said that it’s relevant? So now, you need more than just backlinks to rank. You also need tweets, likes, and other “votes” from social users to let search engines know that your brand is relevant. Depending on what vertical you’re in and what kind of products/services you sell, your content can probably be made to fill one of these roles. In an effort to come to a better understanding of just what social media is worth, it’s important to actually segment out and track social media traffic. With a set of filters, a few goals, and a custom report, we can start to track which traffic mediums impact our business and deserve a greater focus. We’re able to track each individual traffic medium and compare it against the number of goals completed. Google Analytics isn’t the easiest platform to navigate, so follow the screenshots below to get to the settings dashboard. From the settings dashboard we can create the filters and goals needed for the custom report. First, log into your Google Analytics account and click on the gear on the top right of the page. That brings you to the “Account Administration” screen. Click on the specific account you want to create the report, filters, and goals for. Did you know there are small adjustments you can make to your use of Facebook’s Like buttons/social plugins that can have an incredible impact on your traffic? Facebook can provide a level of engagement between businesses and consumers that you simply didn’t see much before it was around. Naturally, as a result, Facebook has proven to be an indispensable marketing tool and driver of website traffic. Granted, the content has to be compelling, but you already know that. – The average media site integrated with Facebook has seen a 300% increase in referral traffic. – Users coming to the NHL.com from Facebook spend 85% more time, read 90% more articles and watch 85% more videos than a non-connected user. – ABCNews.com, Washington Post and The Huffington Post are said to have more than doubled their referral traffic from Facebook since adding social plugins. – Levi’s saw a 40 times increase in referral traffic from Facebook after implementing the Like button in April 2010 and has maintained those levels since. – Outdoor sporting goods retailer Giantnerd.com saw a 100% increase revenue from Facebook within two weeks of adding the Like button. According to what Facebook told Sullivan, Like buttons get 3 – 5 times more clicks if versions that show thumbnails of friends are used, they allow people to add comments, they appear at both the top and the bottom of content, and they appear near visual content like videos or graphics. He looks at a specific example with Metacafe, which originally had a Like button at the bottom of its videos, but after adding one to the top in addition to it, tripled its number of daily likes and doubled its amount of referral traffic from Facebook. That’s a pretty huge impact from such a simple adjustment. Social media marketing has entered a new era. Brands are no longer content to simply experiment with a Facebook page and a Twitter account and “hope for the best.” With social media marketing budgets on the rise, marketers need their social campaigns to drive bottom-line sales, measurable brand benefit, and improved customer lifetime value. The maturation of the social media space has created the need for simple, standardized measurement techniques that clearly show whether social campaigns are working to deliver real brand impact and actual sales. Unlike the online advertising industry, which has standardized on a few key metrics (CPC, CPA, and CPM), social media success measurement is still in its infancy and continues to suffer from a lack of common metrics standards. Large brands are able to license powerful social media analytics software and hire agencies to help them measure social programs with accuracy. However, many smaller organizations are unsure of how to best measure their social marketing programs. Out of the many numbers we could measure for social media, how do you determine which are the key metrics you should measure now and in the long term? The answers to these questions are complex, but every company can get started with social media measurement by focusing on three simple metrics. These metrics won’t tell you everything about the impact of your social media programs, but they will establish a low-cost, repeatable standard you can use to gauge success over time. Assuming your business has invested in a solid brand community presence on social media networks like Facebook, Twitter, YouTube, Flickr, and launched a few managed blogs, measuring the total active size of your social CRM program is the simplest key metric to regularly evaluate. Absolute size isn’t as important as whether your program steadily growing over time. The sCRM metric offers insight into the value you’re creating for those communities, as well as size of the ‘captured audience’ that has granted you permission to receive regular messaging, deals, and content. To do: Manually collect figures from key channels; calculate weekly or monthly; save figures in basic spreadsheet; produce sparkline graphs to depict trendline. Bonus points: calculate same numbers for top three competitors and compare monthly. Many large brands use sophisticated social content sharing tools to exactly track social media link clicks, content pass-along, and other deeper metrics. However, you can start simple and focus on the total unique site traffic coming to your website from links shared through blogs, forums, and the key social networks. You can get this with a simple query through your Omniture, WebTrends, Google Analytics, or other website analytics tool. To do: Export absolute sTraffic # and % of total site traffic from your site analytics tool to a spreadsheet, then produce month-over-month sparkline graphs to depict trendlines. Facebook is a more valuable source of traffic to top news sites than Twitter, according a Pew Research Center study released Monday. The study looked at Nielsen data from the 25 news websites with the highest number of unique monthly visitors. About 35% to 40% of traffic to the sites came from links on other sites, as opposed to readers typing in a URL directly or clicking to another page on the same site. Unsurprisingly, Google dominated this referral traffic. On average, the company’s search and news products accounted for about 30% of all clicks. But Facebook also referred a significant percentage of each site’s audience. The Huffington Post was boosted the most by Facebook referrals, which accounted for 8% of its unique visitors. The New York Times derived 6% of its traffic from the social network. For all its success at breaking news, Twitter did not have the same effect. The site with the highest percentage of traffic from Twitter, The Los Angeles Times, could only credit the micro-blogging platform with 3.53% of its traffic. Twitter referred a much smaller percentage of traffic to other sites in the study. Facebook Fanpages – 3 Ways To Drive Traffic Revealed! In 2010 Facebook grew from 337 million to 585 million users, and is not showing any sign of slowing down. Which means that almost 8 new registrations per second have occurred in the last year. Do you know how to tap into this every growing market of users? Social marketing is a huge buzz word at the moment as more-and-more companies and marketers are looking for ways to tap into the huge audience that is seemingly available with Facebook. Have you looked into ways to drive traffic with Facebook Fanpages? There are many ways to generate buzz with Facebook, and there are many companies that are doing just that including Coke, Starbucks and Oreo, just to name a few. 2. Be unique – With over 500 million people to reach out to, you can’t assume that they will be drawn to any old thing. Don’t just put up a fanpage for the sake of it – take some time and think about the content that you want to have on the page. Look at what others in your market / niche are doing, and try and do something similar, but with a new twist. Ensure that you are using the same sort of branding as you do in the rest of your marketing. 3. Create Fun – Competitions and giveaways always get people’s attention. By offering something for free you are generating interest – and in turn you will drive a ton of traffic.